Flexahopper Plastics is a 100% Canadian owned and operated rotational molding plastics company founded in 1967 and headquartered in Lethbridge, AB. Flexahopper produces a wide range of oil and gas, agricultural, and marine products as well as packaging and aerospace components. Our employees take great pride in the quality and workmanship of each item. Flexahopper Plastics is committed to world-class customer service, strong quality control, and continues to invest in advanced processing technologies. Through membership in many professional and trade associations such as ARM (Association of Rotational Molders), as well as extensive research and development, we are successful in taking many complex and difficult to produce products to market. Our owner is a former chair of the global rotomolding alliance (ARMO) and frequently presents new developments to the industry. It takes more than just high-grade materials to produce a quality product. That's why, here at Flexahopper Plastics Ltd, our resources include cutting edge technology and expert service to assure complete customer satisfaction. LARGEST SOLAR ARRAY IN THE INDUSTRY! In October 2017, we "flipped the switch" on our solar array. 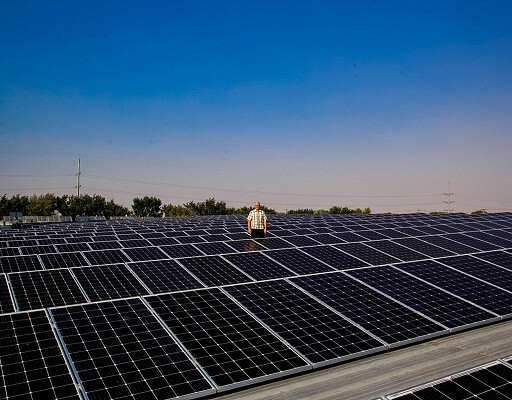 The system consists of 508 large solar panels (167kw) and it will produce an estimated 212Mwh (megawatt hours) of power annually. 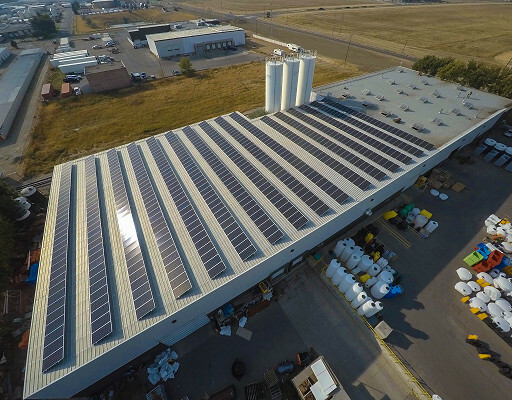 All of the solar panels are produced in Canada. This initiative has made us the greenest rotomolding company in the world. We are very proud to be leaders in the industry! Bullfrog Power, Canada's 100% green energy provider, offers homes and businesses clean, renewable energy solutions. By choosing Bullfrog Power's green energy, Flexahopper Plastics has significantly reduced its environmental impact since 2007. By working with Bullfrog our company supports the development of new renewable generation in Canada and helps to create a cleaner world for today and tomorrow. 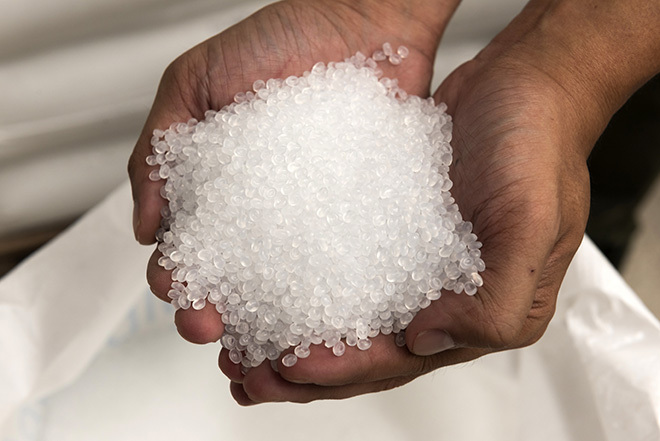 Flexahopper Plastics has always recycled its plastic waste by working with other processors. We always try to minimize our waste that is why we have implemented many “cradle to grave” programs with our products to ensure they don’t wind up in the landfill. Flexahopper utilizes the highest quality materials in the market. We also try to use some of the engineered materials that reduce manufacturing time by 10% resulting in better energy efficiency. Flexahopper Plastics invests in cutting edge technology to reduce consumption of natural resources and time. For example, Flexahopper introduced a new machine design developed in cooperation with Ferry Industries last year. This machine has demonstrated major reductions in gas, consumption, and water use. Additionally it allows us to lower our plastic waste by producing the right parts every time using closed loop controls systems. Our CEO, Bill Spenceley, has spoken of energy reduction and waste in our industry. He has delivered his message to audience worldwide and continues to publish articles in trade magazines on this subject. Flexahopper continues to find ways to lead our industry in green technologies. We are proud to work with great companies and we invite you to explore their products and services. Your decision, your movement, your clean energy future. The Affiliation of Rotational Moulding Organisations (ARMO) was established to provide an equal forum for organisations serving the global rotational moulding industry. The Association of Rotational Molders (ARM) is the premier organization of the rotational molding industry worldwide. We promote and champion rotational molding. IASA currently represents 28 companies in Lethbridge and area. The local industries and suppliers come from various sectors, including manufacturing and food processing.